I’m trying to move on, I really am. Best of intentions. Something current in mind. But then, when it’s time to sit down to write, it is the old material that finds its way to the top of the pile. Perhaps it is the urge to trace some intellectual and historical personal origins. Perhaps I am trying to tell you who I am. My mother was born in 1931, which means she must have enrolled at primary school in 1937. That’s when she learned those basic skills: to count and to form letters and to put down her thoughts in writing. Although her parents could speak Italian (her father more so than her mother), this is also the time when she would have been first exposed to the national language for sustained periods of time, rather than the Mantuan dialect spoken at home and in the rest of the village. Having started school in 1937, my mother would have been given one of these. The book for the first grade, produced by the official state publishing house. The primer used by every first grader in the country. 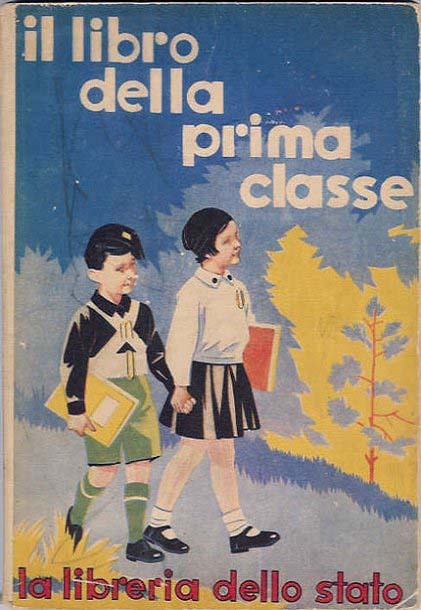 On the cover, a boy and a girl dressed as a Balilla and a Piccola italiana, for starting school also meant being initiated into Fascist life and taught a series of progressively more militaristic values. 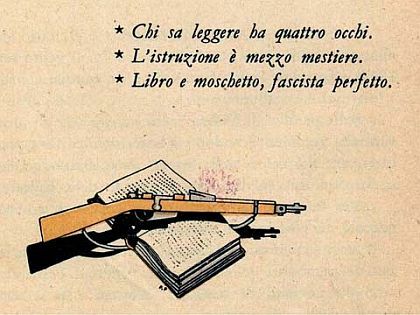 ‘Book and musket make the perfect Balilla’, the boys were told, and that getting an education – in a country that at the time of Papini’s invective against public schools had one of the worst rates of adult illiteracy in Europe – was of the utmost importance. Those who learn to read acquire an extra pair of eyes. An education is half a profession. Book and musket make the perfect Balilla. 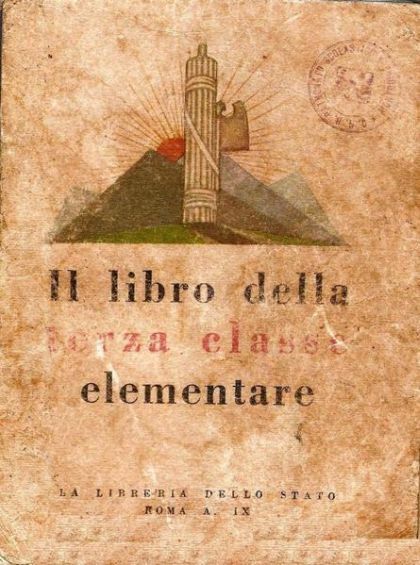 These were the twin and indivisible aims of the reform drafted in 1923 by neoidealist philosopher Giovanni Gentile, and that Mussolini called ‘the most Fascist of all reforms’: to impart to all children the basic academic skills and, at the same time, to inculcate the values of Fascism in every Italian youth. To Rome! Heroes, to Rome! Here they come, here they come, the Piccole italiane, those pretty Italian swallows. Dear Piccole italiane, life will indeed be merry for you. 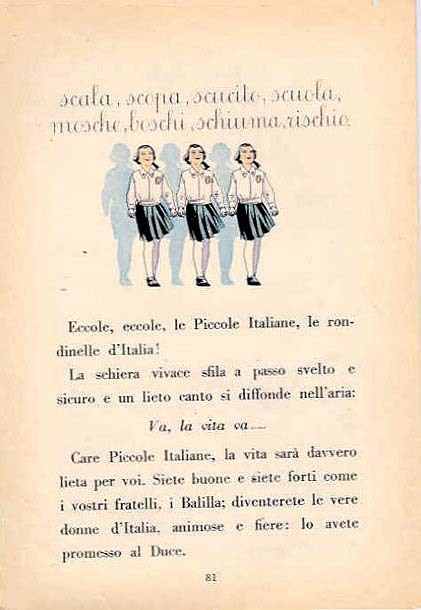 Be good and be strong like your brothers, the Balillas; you will become true Italian women, spirited and proud: it is the promise you made to Mussolini. Fascism was the actual, the only subject of our public school, especially in the early years, and to learn about Fascism, to learn to be a Fascist, meant to learn to love il Duce. For did he not love the children? Here is a story about summer holidays included in the readings for second graders in 1938. 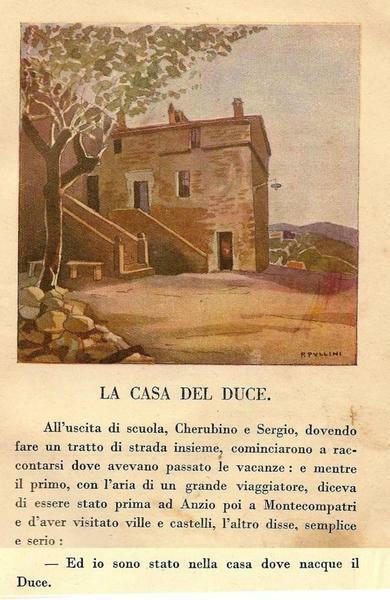 – I have been to the house where il Duce was born. The Adventures and Punitive Expedition of Fascist Pinocchio, a book that recasts the anti-authoritarian, mischievous creature imagined by anarchist Carlo Collodi as a black shirt intent on administering the humiliating punishment reserved to communists, socialists and other dissenters: a robust dose of castor oil, after the subject has been physically subdued and most likely beaten. Such grotesquely violent messages, whilst not officially sanctioned by the publisher of the state primers, were also part of the teachings, and of the texture of everyday life under Fascism. But looking at these materials what strikes me most of all, even more than the whitewashing of history, or the clumsy, pompous cult of the leader, or the elision of social differences in the fictional Italy portrayed by these books, is the extraordinary extent of that interpenetration, the depth at which those values where embedded in the curriculum. You learned to write your first words, and it was the vocabulary of the regime. You learnt to put words together, and they formed Fascist slogans. In maths you’d encounter problems like this: ‘The battleship Vittorio Veneto is armed with three heavy cannons, 12 pieces of medium artillery, 12 pieces of small artillery and 20 machine-guns. How many weapons are there on this powerful ship?’ The laws of orthography, of syntax, of grammar, of arithmetic hadn’t been reformed, but like in an Orwellian premonition, those children might well have felt that in that language and with those numbers you could only express Fascist ideas. We know that this isn’t so, that this isn’t how grammar or arithmetic works, that there has never been and likely can never be such a thing as Newspeak. We know also of the failure of that school to make a generation of Italians forever loyal to il Duce. We may take some comfort from that, as I do from the fact that my mother used the ability to read and write that she acquired under the regime to read and write very different things, and later graduate – one of only a handful of women from that primary school – and later still endeavour to teach another generation of pupils what Fascism had been. The majority of the images in this post are taken from Dietro la lavagna and from the beautifully curated website of the Lissone branch of the The National association of the Italian Partisans (ANPI). As I’ve said before, I love this sort of stuff (though with a guarded love this time). I guess you could find indoctrination (brainwashing) in school primers from any period or country – inculcations of prescribed ideas and ways of thinking about gender, class, ethnicity – even, or especially, today. Which makes this analysis relevant still. Sticking to Italy, what were the preconditions that enabled such a wholesale malevolent brainwashing. I’m guessing it had to do with the recent unification, the crushing of local (non-literate) identities by killing off dialects (pruning the oral tongue) and grafting on a nationalist tongue, and pen to forefinger? Or do I have it totally wrong? Fascism itself was a precondition, and the school system as it had been designed – Papini wasn’t wrong about much of that – along with its failure to actually make inroads into the massive illiteracy that was the only condition most Italian regions had ever known. As a result of all this the Italian people was or might have seemed something of a blank slate. You may have a point too about the dialects. Effectively most pupils were educated in a second language, a language that carried more authority than their own. So fascism is a tautology: the same idea in different words, different worlds? Interesting, and frightening, to think the process we call fascism should ring true all ways; even if foreign, and proven false. Not quite. Popular as it became, the Fascist party wasn’t democratically elected, it seized power in a coup d’etat. And seizing this power allowed it to pass laws about what schools should teach and how. In this sense Fascism was a precondition to the propaganda that followed, and not itself a product of that propaganda. Thanks. Your explanation clears that up. When it came to English grammar at school, I never was any good at parsing all those sentences, or conjugating all those Latin verbs. I remember though enjoying marching in strict formation to the chant of “Hic, Haec, Hoc! Hunc, Hank, Hoc! Huius, Huius, Huius! Huic, Huic, Huic!” which is a worry now, after this great post. Astonishing. 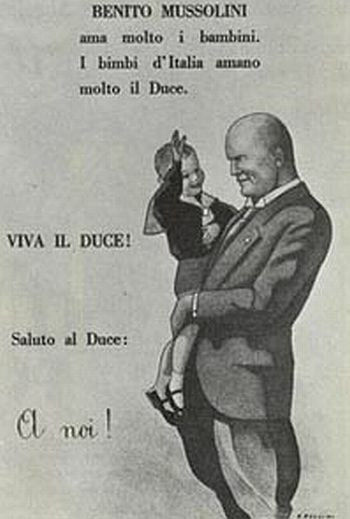 I don’t know which is the more amazing, that image of il Duce staring malevolently at a little boy or ‘The Adventures and Punitive Expedition of Fascist Pinocchio’. Do you know how these compared to other syllabuses? I mean, I’m wondering how much of this conscious attempt at propagandising was shared with other countries. Were French or English kids also doing sums based on the weapons of battleships? I haven’t come across other syllabuses – they’re pretty hard to come by – but I do have some of the school journals sold across the British Empire and whilst their politics is predictably dodgy they are nothing compared to the readings in the Italian syllabuses in terms of their propagandistic intent. And I know it’s hardly a like for like or systematic comparison, but while Italian kids were exposed to the vileness of Fascist Pinocchio (like you, I can’t quite get over it), British kids could turn to series like Richardson’s Introduction to Citizenship, that I personally find quite admirable and sympathetic. You simply couldn’t imagine books like those circulating in Italy at this time. When I was working in Beijing last year, my office was in the remains of the garden of a Qing Dynasty princess and I walked back to my seedy hotel via a street that was inhabited by elderly remnants of the current regime. It was, it was explained to me, a quarter devoted to the People’s Liberation Army, which explained the creepy bronze statues of military men placing their consoling hands on the knees and shoulders of young children. The rest of my walk home took me along a lake built by the orders of Kublai Khan (not Xanadu – Beijing was his other capital). At the opposite end of the lake to the direction I normally went was a tourist trap where you could enjoy overpriced beer and be accosted by touts for prostitutes. Across the lake was the home of Madame Su Yatsen. 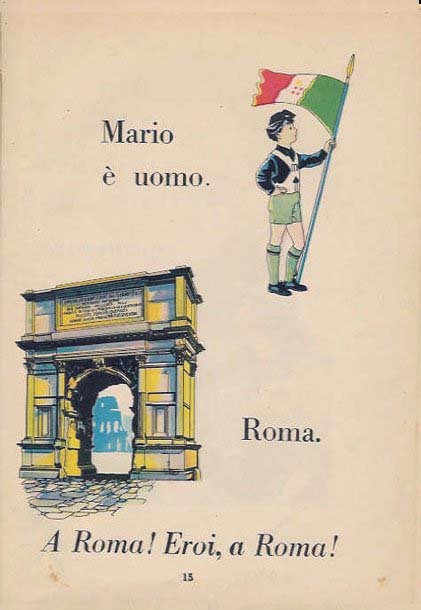 It was like a palimpsest of ideological constructs, a bit like this example from fascist Italy. Your mother survived without turning into a fascist automaton, as I suspect the inhabitants of Beijing do. Our rulers think they have a blank canvass on which to paint. but reality is far mor complex. Great stuff Giovanni. Fascist Pinnochio is a wonder to behold. I really appreciate these posts. They’re one of a kind. Wonderful! And stirs my deep misgivings about our own patriotic mainstream primary school education. Go Goddess Grammatica, however: she won’t be tamed by ideology. And neither would your mother, by the sounds: viva! yes fascinating, thanks Giovanni. 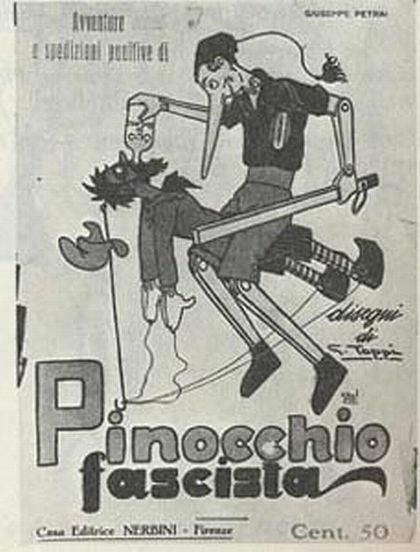 Pinocchio fascista a revelation. I esp like fact that your mother went on to endeavour to teach another generation about what fascism had been. The thing about that is that it was never a given, even for an intermediate school teacher. I for instance never studied Fascism at school. Not at primary, not at intermediate – save for some books and films on the topic in the second year, as part of our literature studies – and not in high school. It was always part of the curriculum in theory, to be covered time permitting at the end of the last year of each course of studies, but time seldom permitted after you had diligently covered the whole of history that preceded it. So I studied the Phoenicians three times, but never the second world war. And I doubt mine would be a very unusual case. Thanks for such a fascinating read, Giovanni. The Pinocchio fascista is compelling in its Orwellian likeness, I concur. Love the ending too – your Mum teaching others about fascism; what an achievement.